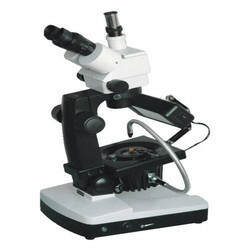 Providing you the best range of gem 200 gemology microscope with effective & timely delivery. Gem Microscope has high definition and high resolution rate of solid image, the structure of Trinocular viewing body provides special interface. Magnification range zoom magnification 7x, 45x, working distance 95mm, super wide-field eyepiece 10x/23mm, adjustable interpupillary range 55, 75mm. The connection method of lamp tube is easy to adjust the angle of illumination. Focusing range 125mm, it can observe for different size gem and sample. The character of steel clamp is moderate to hold hard, conveniently. Due to it can reduce to cover the beam of gem haunch, so that you can observe entirely. The both sides of working stage have fixing holes of gem clamp, therefore, it can adjust the high and angle of observation spot and operate more conveniently & comfortably. The illumination equipment is very reasonably. Accessories will be supplied steel and flat gem clamp, which can be selected by user. You can observe well the crystal character of inside and outside of Gem structure when you use the polarizer. It can be satisfy for different requirements. Working Stage There are the fixing holes of gem clamp the both sides of the stage, you can adjust it according to your choice. Arm Rotatable from 0~45 Degree, so you can adjust the height and angle of observation spot and operate more conveniently and comfortably. Steel Clamps Steel claps with appropriate rigidity, less Shade at the lumbar of the diamond, which can help to observe in all directions. Looking for Gemology Microscope ?